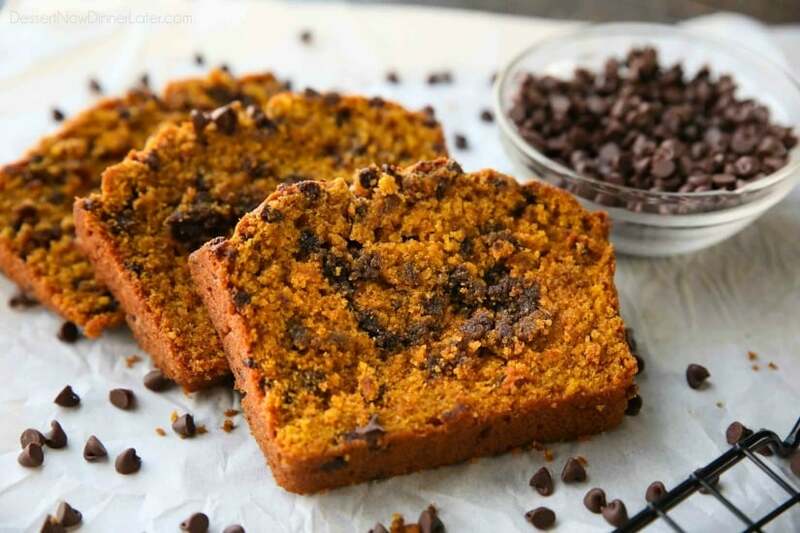 Pumpkin Chocolate Chip Bread (+ Video) - Dessert Now, Dinner Later! 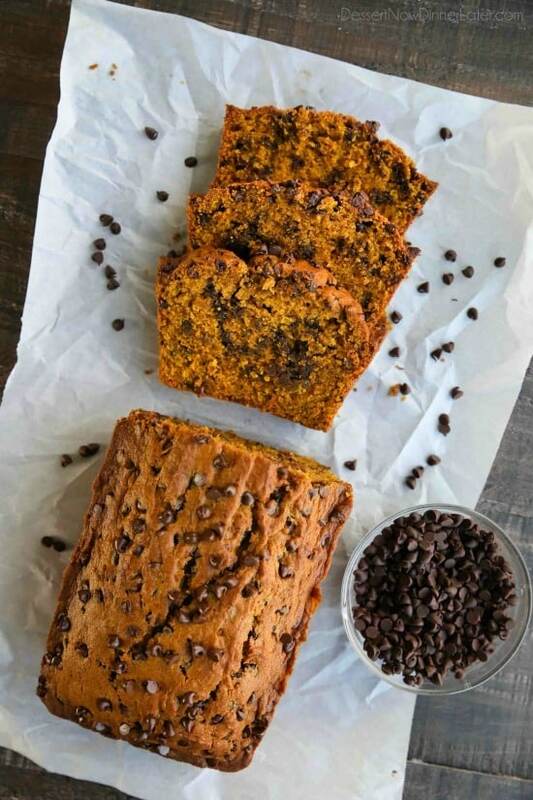 This Pumpkin Chocolate Chip Bread recipe makes two loaves and uses one full can of pumpkin. Save one loaf for you and take the other to a friend, or freeze the second loaf to enjoy later on. 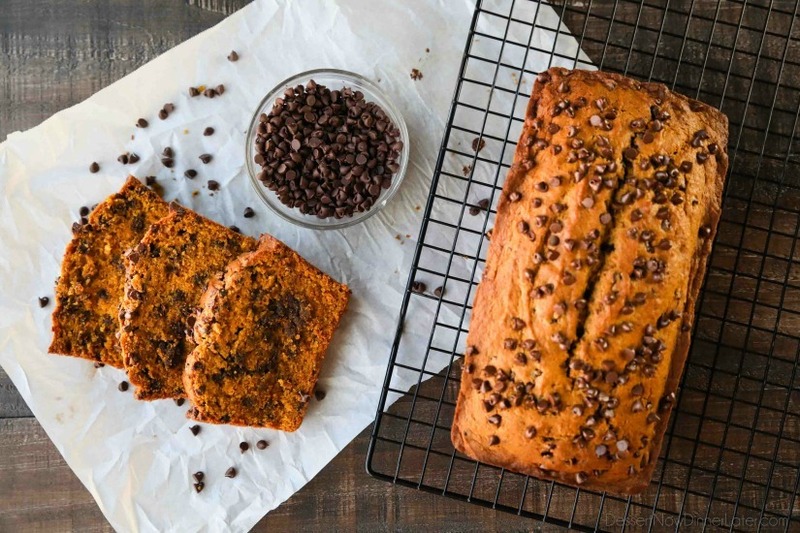 This bread is simple, classic, and delicious! 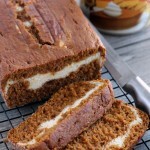 If there’s one thing I love about fall, it’s pumpkin desserts! 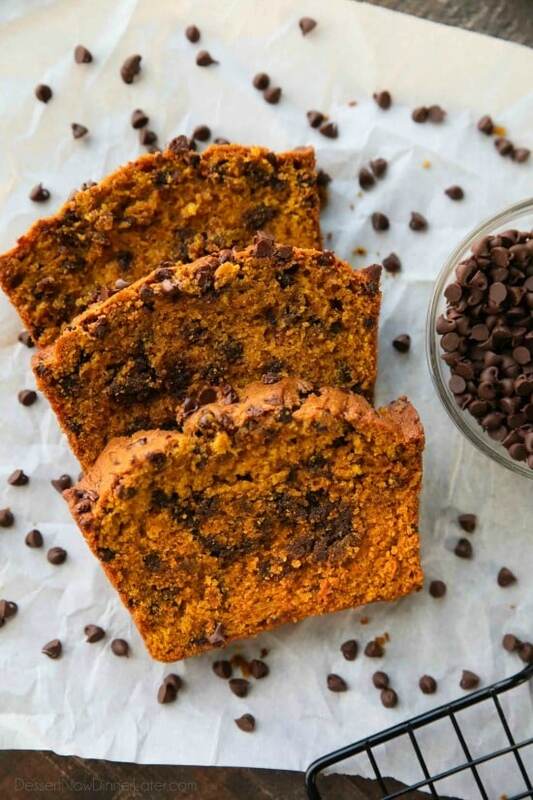 And now that it’s officially fall, I’m happy to share my recipe for Pumpkin Chocolate Chip Bread with you all. And it’s a good one! Let me tell you why. 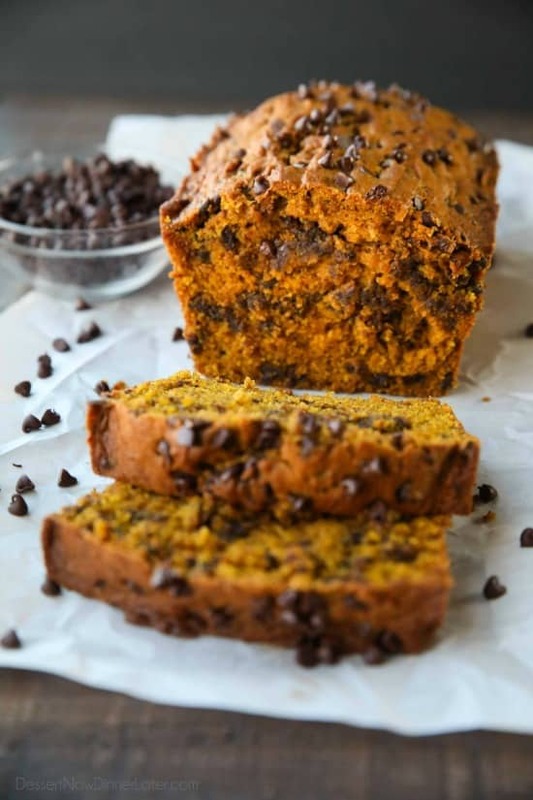 The only downfall to most recipes for pumpkin chocolate chip bread is that they only use 1 cup of pumpkin, so you have some leftovers that you never know what to do with. (Well, I do have one idea.) So I’ve created this recipe to solve that problem! It makes TWO loaves, but you can freeze the second one, or be nice and share with a neighbor or friend. 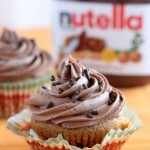 You can also easily use this recipe for muffins. Just bake at 400 degrees Fahrenheit for 15-18 minutes. I wouldn’t blame you for not wanting to wait almost an hour for the loaf to cook. It’s tasty either way. 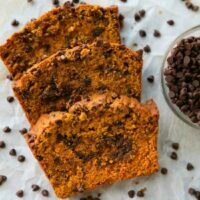 Pumpkin Chocolate Chip Bread is one of my favorite fall recipes! What are some of yours? Tell me in the comments below! Preheat oven to 350 degrees Fahrenheit. Grease two 8x4-inch loaf pans. Set aside. Combine flour, salt, baking soda, baking powder, and pumpkin pie spice in a bowl. In a stand mixer, cream the butter, oil, and sugar until light and fluffy. Add pumpkin puree and eggs. Blend until combined. Scrape bowl. Slowly add the flour mixture. Scrape bowl. Mix or fold in the chocolate chips saving a Tablespoon or so for the top. Divide batter between the two prepared pans. Top with extra chocolate chips. Bake at 350 degrees Fahrenheit for 50 to 60 minutes, until a toothpick comes out clean from the center. Allow to cool slightly in pan about 10 minutes, then invert onto a cooling rack to cool completely. Store leftovers wrapped in plastic wrap or in a zip-top bag. 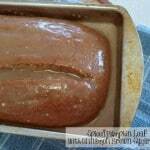 - To Freeze: Double wrap loaf in plastic wrap. Freeze up to 1 month. Wrap in an extra layer of foil or a freezer bag for longer storage. -To make just enough Pumpkin Pie Spice for this recipe combine: 2 1/4 tsp cinnamon, 3/4 tsp ginger, 1/2 tsp nutmeg, 1/4 tsp cloves, and 1/4 tsp allspice. I made this recipe with fresh roasted pumpkin and it was delicious! I doubled the recipe and put one loaf in the freezer. That’s great! Thanks for letting me know! My son and I made this today! Came out great, and plenty for 2 loaves! Awesome! Thanks for your comment Christine! I also wanted to let you know that this got rave reviews at work. I am told that my boss ate half of a loaf by himself, and then had to ask the office admin to take it away. 🙂 Making it again for our Thanksgiving potluck. That makes me so glad! I’m happy to know this recipe has been well loved! Thanks Christine!